Finding the perfect wedding dress begins with finding the right shape for your body. 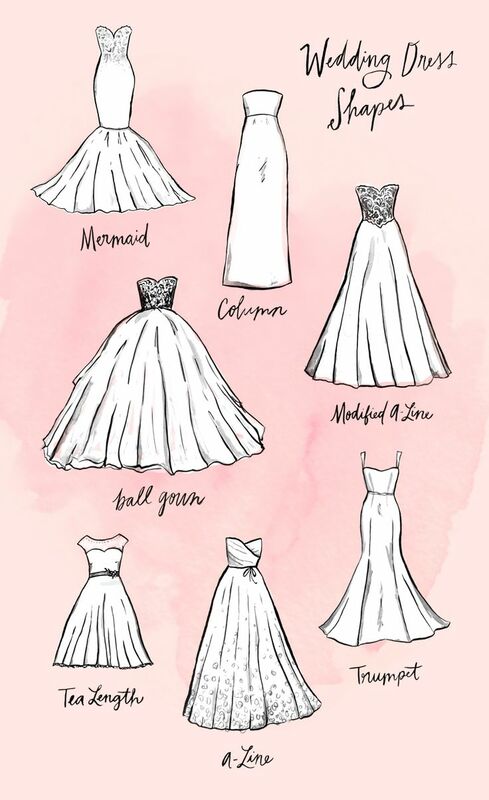 There are five basic gown shapes, including trumpet, mermaid, sheath, a-line, and ball gown. Once you've narrowed down to one silhouette, deciding on a combination of materials and details is easy! At The Bustle, our bridal stylists will help you find the right fit for your wedding day. Trumpet This is a fitted style that begins flaring out just below the hips. It shows off your curves enough while still giving you enough walking space to dance the night away! Mermaid This style is great for brides who want something a little more dramatic to show off their curves! It's more fitted than a trumpet fit, and begins flaring out at the knee or lower. Sheath This is slim fitting style perfect for brides who want a sleek and effortless look! It hugs your body head to toe, and is a great silhouette for wanting to elongate your figure. A-line This is universally flattering on every figure! It's fitted at the bodice to show of the smallest part of your waist, and flares out from there. It looks especially great on brides who want to conceal their fuller hips, or for brides with a sporty figure who want to create the illusion of curves.